One of Shropshire’s outstanding classic bike enthusiasts, Ron Maund, passed away on November 5, and we are grateful to Jim Reynolds for this timely obituary. Ron had been involved with bikes from the 1950s, riding to the TT on a solo in the early days and later taking his family in his Triumph Thunderbird sidecar outfit. 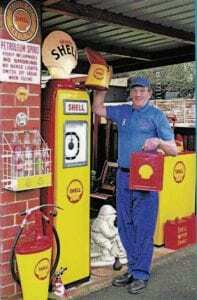 Ron loved petrol pump ephemera. A keen follower of grass track racing, he was involved with Dave Owen in organising major events at Brimfield in Shropshire, and later at Hereford racecourse, where star names were the order of the day. Ron competed himself, in Bantam Grass Track during its formative years, and in local trials. He and his wife Josie, whom he’d met at a grass track meeting, loved watching the cream of the sport in local events like the Victory Trial, and when Geoff Duke won that National event in the early 1950s, Ron and Josie were there to see their hero victorious. After starting work as a carpenter, Ron became a postman, a job he held for 34 years, learning all the back roads in his native Welsh Marches, and where bikes were likely to be found. 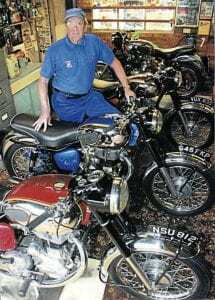 Happy days remembered as Ron is seen with his sparkling collection of Royal Enfield motorcycles. When the Shropshire Section of the Vintage Motor Cycle Club was formed in the 1980s, Ron was the treasurer who guarded the funds and built up a good bank balance. At that time he bought a Royal Enfield 350 Bullet and restored it as an outstanding example of the marque. He progressed from that stage to a collection of Redditch-built classics, from the 250cc Continental single through to the 700cc Constellation twin, all of them immaculate.